* The Wireless Mobile Adapter Utility app must first be installed on the smart device (the app can be downloaded free of charge from the smart device's app store). The D5200 is equipped with a new Nikon DX-format CMOS sensor with an effective pixel count of approximately 24.1-million pixels. It supports a broad range of standard ISO sensitivities, from ISO 100 at the low end to ISO 6400 at the high end, as well as further expansion to an equivalent of ISO 25600 (Hi 2). This support enables capture of sharp and clear images with very little noise, even at higher sensitivities. When used with NIKKOR lenses loaded with Nikon's advanced optical technologies, the roughly 24.1-million effective pixels enable sharp rendering of even the finest details. 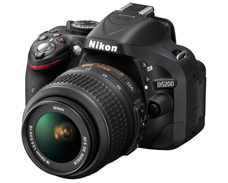 The D5200 is equipped with an image-processing engine equivalent to the EXPEED 3 high-performance image-processing engine built into high-end D4, D800, D800E, and D600 Nikon FX-format cameras. This enables faithful rendering and vivid color reproduction, as well as a broad dynamic range. With capture of still images at high sensitivities, advanced noise-reduction processing effectively suppresses noise to preserve textures and details in images. Noise-reduction processing performed with movie recording results in faithful reproduction of crisp, clear outlines in movies recorded in low-light situations. Adoption of the Multi-CAM4800DX autofocus sensor module enables certain acquisition and tracking of the intended subject with 39 focus points. Utilizing cross-type sensors for the center nine focus points most commonly used ensures reliable focusing performance with certain acquisition of the intended subject and excellent tracking performance. In addition, the number of active focus points can be limited to 11. The Scene Recognition System detects subject conditions prior to shooting and then analyzes scene brightness and color information that is then used with autofocus, auto-exposure, i-TTL balanced fill-flash, and auto white-balance control. The results are most clearly seen with reliable tracking of moving subjects when 3D-tracking is enabled. The system is also able to identify smaller subjects than could the D5100. What's more, when Face-priority AF is enabled with movie recording in live view mode, or when faces are enlarged with playback of still images, up to 35 faces can be recognized. With high-speed continuous shooting at up to approximately 5 fps*, users will never miss the perfect shot, whether framing images using the optical viewfinder or the camera monitor. The densely packed 39 focus points effectively cover the majority of the frame for certain acquisition and tracking of rapidly moving subjects, such as those participating in sporting events. High-speed continuous shooting at approximately 3 fps can also be selected for situations, such as capturing natural human expressions, in which a slower frame rate is preferred. This allows for selection of the optimal frame rate according to the scene. The 3-inch, approximately 921k-dot LCD monitor with wide viewing angle is large and ensures clear viewing. It opens to the left from 0–180°, and can be rotated forward 180° and backward 90° when open. Adoption of a side-hinged vari-angle monitor allows for unobstructed opening and rotation of the monitor when the camera is mounted on a tripod for flexible and stress-free shooting from low angles to high angles, making even self portraits possible. The D5200 is equipped with the D-Movie function, which enables recording of 1920 x 1080 60i/50i movies exhibiting superior picture quality by simply pressing the movie-record button next to the shutter-release button. The new Nikon DX-format CMOS sensor with an effective pixel count of approximately 24.1-million pixels and EXPEED 3 high-speed image-processing engine ensure recording of sharp, clear movies with little noise, jaggies, or moiré patterns. Autofocusing during movie recording is possible using contrast-detect AF. When the focus mode is set to Full-time servo AF (AF-F) and the AF-area mode to Subject-tracking AF, the camera automatically maintains focus on a subject moving throughout the frame. Manual settings* are also available for those who want to specify recording shutter speed and ISO sensitivity according to their own preferences. In addition to the ability to choose the recording frame rate from 50i or 60i (1080), or 24p, 25p, or 30p (1080) per second, the camera is equipped with a stereo microphone for superior audio quality with movie recording. Stereo sound can also be recorded via the optional ME-1 stereo microphone. The D5200 offers seven* special effects that can be selected and applied with recording of both still images and movies. Special effects are displayed in the monitor with the view through the lens before shooting or recording begins, allowing users to confirm the results of effect selection or adjustment in real time. Users can easily enjoy dramatic effects like those seen in the movies using special effects. This mode was adopted to respond to the creative intent of users searching for a way to express their own unique style and creativity. *D5200 special effects: Selective Color, Color Sketch, Miniature Effect, Night Vision, Silhouette, High Key, Low Key. Color Sketch, Miniature Effect, and Selective Color can also be applied to images already recorded from the retouch menu. By simply connecting the Wireless Mobile Adapter WU-1a (sold separately), true, high-quality photos and movies recorded with a compatible digital SLR camera can be easily shared with a smart device. * The view through the camera lens (live view) can be displayed on a smartphone or tablet screen to control remote shooting (remote movie recording not supported), and images captured with the D5200 can be transferred to the smart device over a wireless connection. Using the Wireless Mobile Adapter WU-1a expands the ways in which users enjoy the photos and movies they have recorded with the D5200 and a NIKKOR lens by enabling the immediate transfer of images to family and friends, or uploading to blogs or social networking sites, anywhere and anytime. *The Wireless Mobile Adapter Utility app must first be installed on the smart device (the app can be downloaded free of charge from the smart device's app store). Remote control is more convenient with the D5200 due to support for the WR-R10 (transceiver) and WR-T10 (transmitter) that utilize electromagnetic waves. When the WR-R10 is connected to the D5200, the WR-T10 can be used for wireless control over remote shooting. The WR-R10 and WR-T10 enable remote control over the camera from greater distances and broader angles than are possible with infrared remote controls, and obstacles such as trees between the transceiver and transmitter do not impede communications. Not only autofocus is possible with the shutter-release button pressed halfway but also control over operations such as continuous shooting, movie recording and quiet release mode is possible. Naturally, the WR-T10 can be used to remotely control a single camera to which the WR-R10 is connected, but it can also control multiple cameras to which WR-R10s have been connected1,. The WR-R10/WR-T10 makes photography much more enjoyable as it enables varied expression of scenes using multiple cameras, each with a different lens mounted, and each shooting the subject from a different angle using the vari-angle monitor.